Me oh my it has been hot and dry! We have spend the past two weeks kicking up dust all through the forest and cherishing the life we found beneath the tree tops. A flurry of flowers has made us stoop low to smell, investigate and wonder about, while the fish frogs and beetles continue to fascinate! 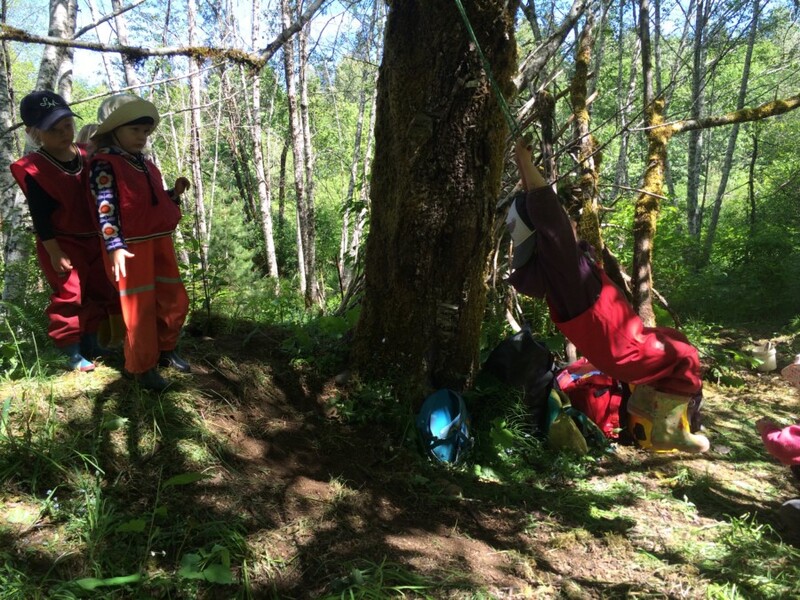 All that and we had photos taken by Kersten, Nova’s mom, we had Amelia’s birthday, we had Kevin from the Village of Cumberland come and do a forest work-party with us and it was mother’s day – whew! This second to last month is really picking up the pace – and we are keeping up! These children continue to amaze and impress us with their capabilities. Their detailed drawing and writing is coming along – each at their own pace, and they’ve walked further than ever. With the visits to the Log Jam classroom extending to a pool of fish and beyond, they’ve really shown us their endurance. Amelia and Finnigan admire a new yellow flower they haven’t noticed in this classroom before. 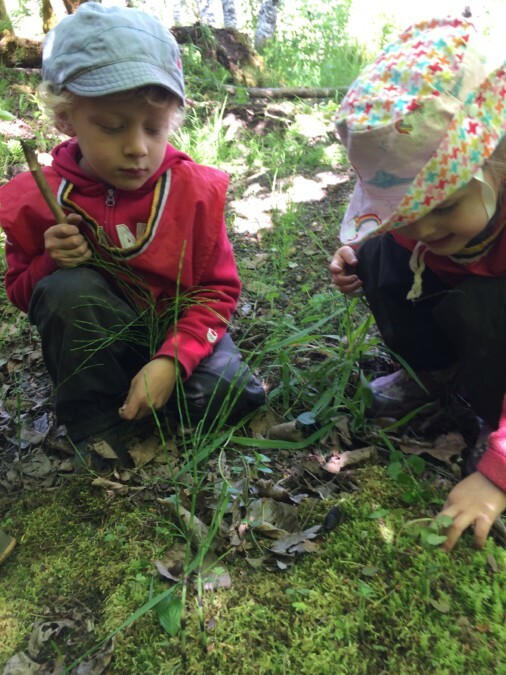 It often takes at least a week before we return again to a classroom, and at this time of year the differences week to week so drastic we often spend the beginning of our day just finding new curiosities. Little walks or ‘explores’, bring us through new areas with out damaging it like we might with continuous play or trampling in one area over and over again. Exploring lets us see an area with new eyes. Here friends are waving at those across they way. 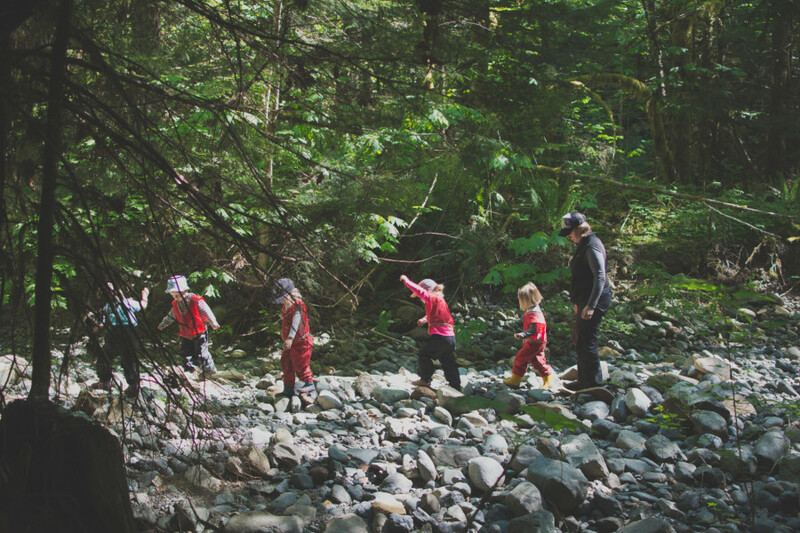 Sometimes children need familiarity and opportunities to revisit and play the same natural spaces to see the changes in it and grow their attachment to it. 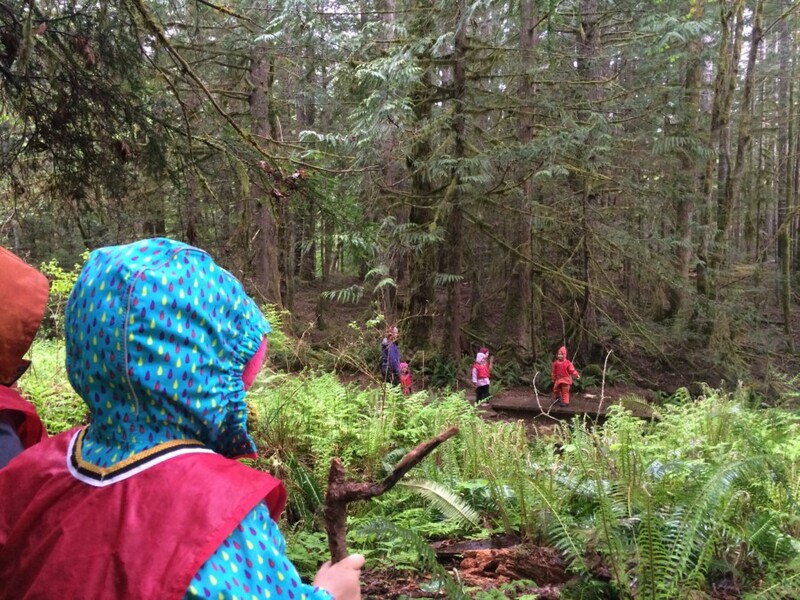 Other times they need to be supported in their wish for adventures and boundary pushing – beyond our ‘classroom’ boundaries! Amelia celebrated her birthday with us by sharing pictures of her at 0, 1, 2, and 3. Everyone ‘oohed’ and ‘awed’ , being supportive and kind to her as she shared her photographs. 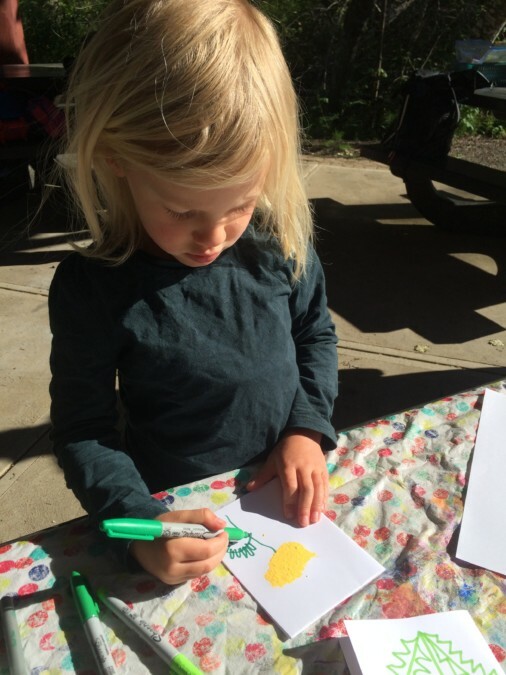 Maeve works with focus on drawing her stem and leaves of a dandelion on her mother’s day card. Everyone’s interpretation of how the dandelion leaves looked was a neat comparison to make. Some were rounded, some spike, some long some stick like and every one of them was beautiful! These girls have taken ownership of the Hand In Hand song. Lately, everyone sings and signs the song loudly, clearly and with enthusiastic gestures. It’s a long way from the quiet mumbling and minor movements we saw in the fall. Sometimes, work = play! Here is Zachary pouring his bucket of smaller sized rocks onto the path so it will be less likely to be a big puddle in the future. 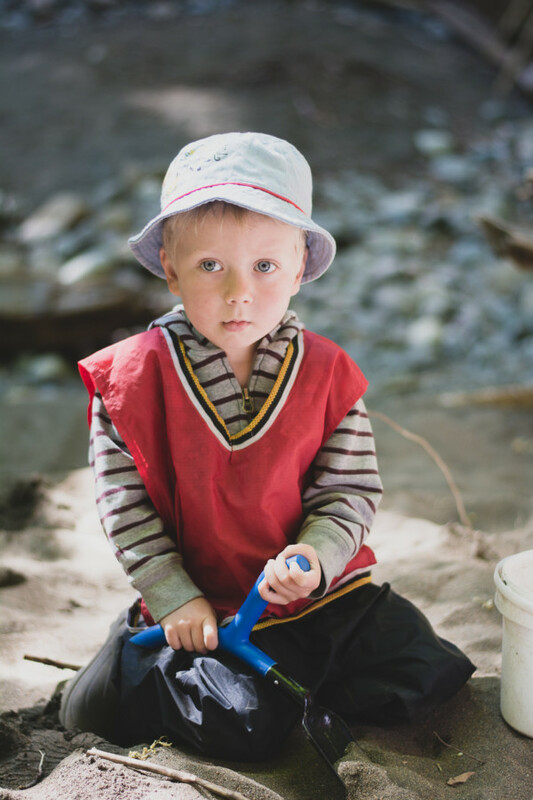 This is similar to the kind of play the kids enjoy – pouring water, sand and dirt from one area to another. The act of simply pouring something out with care can be a tricky one and is one of many skills we practice through play at school. Gemma used hand and whole body strength to keep her legs off the ground on our swing! Friends look on and learn from one another as some flop down, aren’t sure how to hang on or bend their legs enough to make it work the first couple of times around. 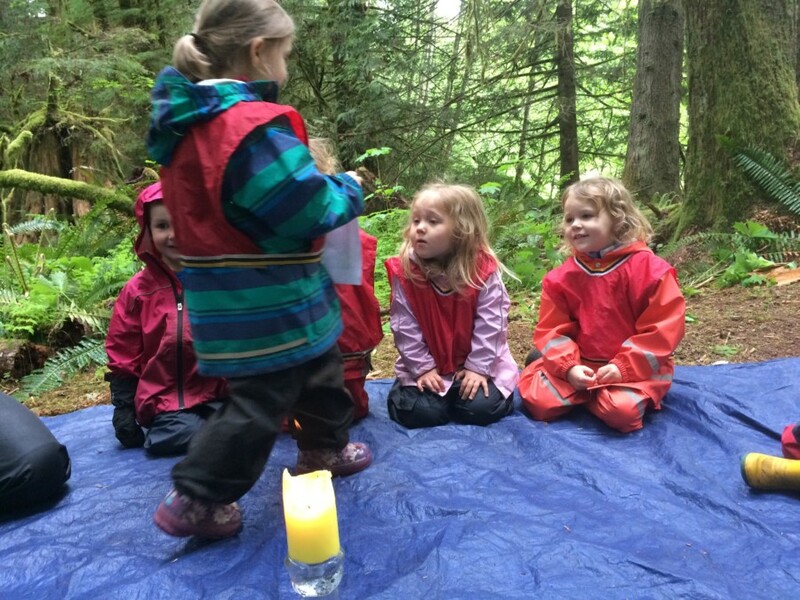 A little persistence went a long way – a fun way! Fin has got a good handle on the new shovels and can easily move sand around. He showed Nova’s little brother how to put the sand in the bucket. 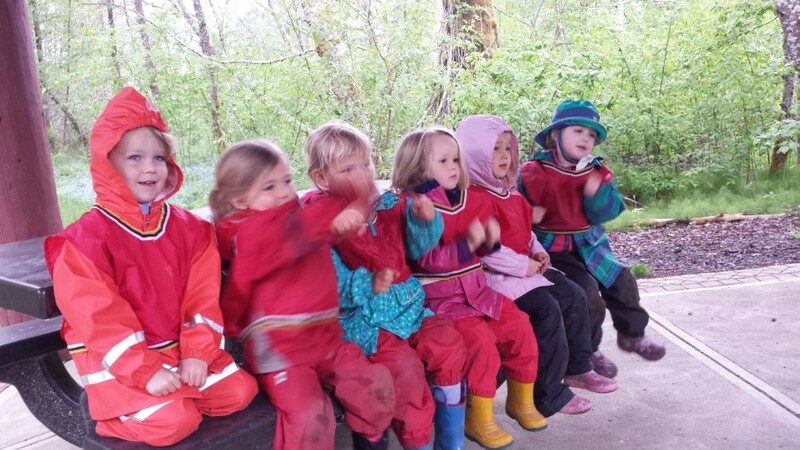 Repetitive movements that children can master increases their muscle memory and self confidence. 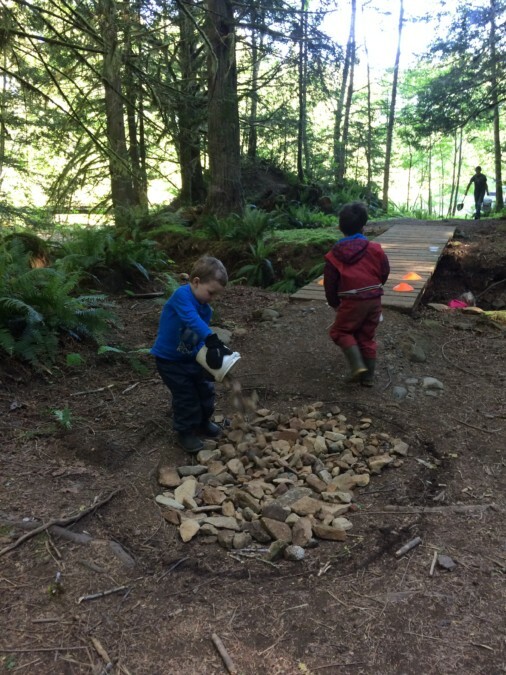 The Seeds love digging at the Log Jam classroom and seem to never tire of it, rather they find new ways to use tools, build and destroy – all part of the process, and another example of work = play. 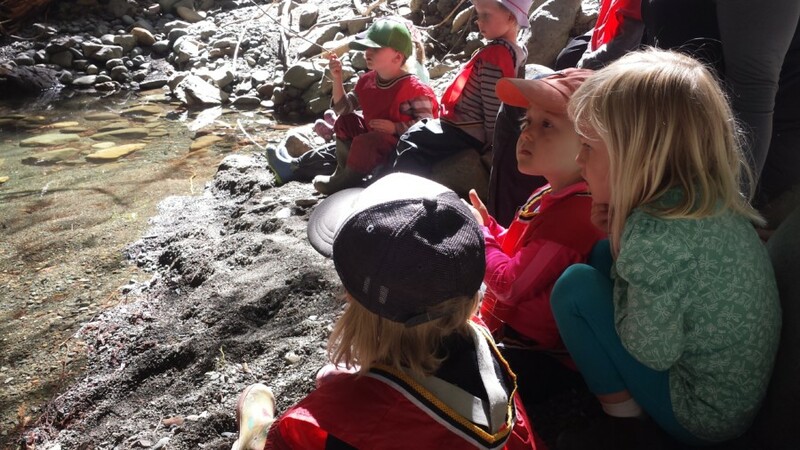 As we watched the fish in the shrinking pool of water the kids guessed what would happen to them if the water disappeared and considered how the fish were ‘feeling’. Extending empathy to animals is a common way children can understand themselves and other’s emotions and needs better. Kaya and Maeve were insistent on having a quiet moment here, to listen for the sounds of water, flies and to just enjoy this peaceful spot.